2019 Edition: Explore extraordinary esoteric knowledge long hidden in myth and secrecy. During a sixty-two month exploration of a closed inner region of the immense Himalayan wilderness, in an isolated valley surrounded by towering ice peaks, adventurer M.G. 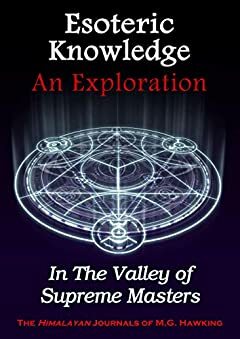 Hawking chanced on a small village where he encountered men and women possessed of abilities and knowledge virtually unknown to the Western world. What exactly is this knowledge? In Aristotle’s arrangement of philosophy, esoteric knowledge falls under the aegis of metaphysics. It seeks to understand the fundamental nature of all reality, whether visible or invisible or anything else. It seeks a description so basic, so essentially simple, so all-inclusive, that it applies to everything. It attempts to tell what anything must be in order to be at all. Religion has never really done this, even though it vociferously claims to do so. Esoteric knowledge embraces three traditionally contrasted, if not completely separable, areas: 1) Experiences of Oneness with the ultimate, commonly interpreted as God, Infinite Being, All-That-Is, et cetera; 2) The extension of Knowing (extrasensory perception, including telepathy, precognition, and retrocognition); and 3) The extension of Doing (psychokinesis and telekinesis). These concepts involve the primacy and power of consciousness acting beyond the field of human ability as generally recognized in the Western world. These powers are however well-supported by research that has greatly enlarged our comprehension of the universe as compelling discoveries emerged from the field of quantum physics. The accounts presented in this anthology are transcribed directly from the archived field notes and journals of Hawking’s five years in remote Himalayan regions of Nepal and Tibet. These rare accounts contain detailed descriptions of his encounters and conversations with the legendary Himalayan masters, providing first-hand narratives of the masters' expressions and explanations of the fundamental knowledge, essential principles of consciousness and specific practices that are capable of conveying exceptional perceptive abilities and personal powers. Many readers have found that the knowledge expressed in this book resonates within them, as if awakening a quiescent but latent awareness. This is entirely natural; truth seems always a reincarnation or echo, since truth remains the same through a thousand generations—truth is timeless, only doubt is new. As entertaining as it is richly enlightening, this book is an incomparable exploration for anyone on a spiritual path or seeking greatly expanded personal knowledge and power. 2019 Edition Anthology, 10 Books, 14 Sections, 38 Subsections, Kindle e-reader page count 312 (estimated, actual count varies depending on the reading device used).